WHAT IS THE BEST AGE TO START PLAYING? The younger the better! Tennis for beginners is much easier when you're very young. Most touring pros started playing before they turned 10, and in many cases, much younger! For instance, Andre Agassi's father, Mike, first introduced Andre to tennis "before he could walk, before he could talk, before he could even sit." Mike Agassi had "read somewhere that the first muscle a baby develops is the one that allows him to focus his eyes. And so, even before my new baby boy was released from Sunrise Hospital...I designed a special mobile for his crib that consisted of a tennis ball dangling from a wooden Garcia tennis racquet." (Quoted from The Agassi Story by Mike Agassi). sign them up at a local 'tennis for beginners' class. If they really enjoy the game, I strongly recommend that you supplement your child's tennis by feeding him or her balls at every opportunity. I'm sure any coach will be more than happy to have you do this. But no matter what age you are, it is imperative that you get some expert coaching. Without it, it's guaranteed that you'll develop a poor technical foundation for your strokes, which will not only severely limit your future playing level, but, over time, will also increase the chances of incurring injuries like tennis elbow. 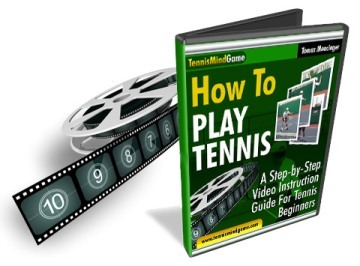 For a really useful source of information, you'll find this series of instructional tennis videos for beginners presented by my friend, Tomaz Mencinger, to be tremendously useful. If you want to "learn technique that lays the foundation for advanced strokes when you're ready for them," you'll "save hundreds of dollars of dollars on tennis lessons by getting all the same information here for less than the price of one lesson. As a coach myself, I find that it's extremely useful to be able to demonstrate to my students how I would like them to play their strokes. Tomaz's video presentation gives you exactly the same opportunity as my students. He gives you the opportunity to learn the fundamentals of each tennis stroke visually. He doesn't overload you with technical jargon, he demonstrates in clear, step-by-step fashion the fastest way for you to develop a technically sound game that will make the game far more enjoyable for you in the future. TENNIS FOR BEGINNERS: WHAT EQUIPMENT DO I NEED? Ages 2-4: For the boys, the Prince Air O Blake 21" features a Fusionlite Alloy O-Beam that is lightweight and strong. For the girls, the Prince Air O Sharapova 21" is a great choice. Ages 5-7: For the boys, the Prince Air O Blake 23" is recommended. And for the 5-7 year old girls, the Air O Sharapova 23" is a fine choice. Ages 8-10: The Prince Air O Blake 25" is ideal for an 8-10 year old boy. The 105 sq. inch head features a large sweet spot and packs plenty of power. 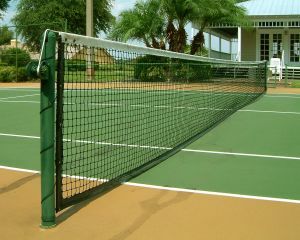 And for the girls, the Prince Air O Sharapova 25", which has the same specifications, is also recommended. Ages 10-12: The Head Flexpoint Radical 26" Junior Racket is ideal for a junior player that is looking for a racquet that is lightweight, powerful and has a big sweet spot. For beginners, racquet head size is a big factor in determining how easy it is to hit the ball in the "sweet spot". Anything smaller than 90 sq" makes tennis for beginners quite difficult. Although here, I hasten to add, Pete Sampras attributes a significant factor in his development was due to the fact that he learned to play with the now obselete wooden racquets, which had a head size of less than 80 sq". For older beginners, particularly adults, racquets with a headsize of over 100 sq" is appropriate. They have a larger sweet spot, are more powerful, and, early on, they make playing more fun. The second most important piece of equipment is shoes. It's essential that they provide good lateral support and adequate cushioning, particularly if most of your tennis will be played on hardcourts. Whatever you do, before making any purchases, please make sure you check out the extensive information on tennis footwear, here on my site. Finally, thank you for visiting my tennis for beginners page. I hope I've provided you with some useful information, and please feel free to have a look around the rest of my site.